This Spring Break we took a huge family vacation for us, the first big one since before Corbin was born actually and he will be 4 this summer. The last major family vacation we took was when I was pregnant with Corbin so this 11 day 3,000 mile trip to Texas and back was a HUGE trip for us. Let me state that my boys are not the best travelers in the world. Yes we spend a lot of time in the car just to get to the grocery store but that has not made them the best travelers in the world, so 6-8 hours solid hours of driving is tough on ALL of us! They have a ton of pent up energy and Cory and I end up with a ton of pent up madness telling them to settle down and quiet down in the car. Below are 5 travel tips that helped eases all of our pain on this trip. Redbox kind of came as a lifesaver for us, and one we didn’t find at the start of the trip. It’s almost a shame to admit but this was my first experience with a Redbox. We have a few of their locations locally in the valley but it’s a 60 mile round trip in order to return the video so we just have avoided them. However traveling from one city to the next it was amazing being able to rent some of the hottest movies for only a $1.30 a day. Before we left I packed a treat box that didn’t require any cooling and tried to avoid the chocolate as well because we were heading to Texas and it’s already hot as heck there! I filled ours with Pringles, fruit snacks, rice krispy treats, home baked cookies, granola bars, fruit roll ups, drink boxes, waters and Gatorades. I avoided most fruit because we would be leaving our snack box in the car and with 80 degree temps, I didn’t think the bananas and apples would fair to well. I also packed a small cooler with ice packs and string cheese. We had a lot of miles on the interstate, which were a blessing in disguise. Because we had the snack box we could stop at the rest areas and let our children run and scream like hoodlums to get some of their energy out and enjoy snack time. We didn’t feel obligated to snag a snack form a convenience store when we stopped to use the restroom, and it allowed us more than amble time to stretch our legs along the way with some walks around the grounds, small races with the kids and no need to control their volume. We like the busy bag activities because they are quiet and for the most part can be self guided. I already have two sets of each busy bag activity made to keep the fighting over them at home down so this was an easy thing to have two of packed and ready to go. I stored them all in a large Ziploc bag and they could only bring the ones that didn’t require a lot of little pieces. I received a large utility tote from 31 sometime ago and never knew what to do with it. Little did I know at the time that this would be the perfect use for it. I picked it as our toy box because it was collapsible, easy to wipe clean and honestly held the perfect amount of toys for this trip, plus it fits between the two seats in the back perfectly! We tried our best not to let the boys get carried away with the precious little space we would have in the car. Each boy was allowed to pick out 5 toys they wanted for the trip (with the understanding they would have to share!) their Vtech Innotabs, and 3 books a piece. The bag of busy bag activities fit in this space as well. This kept their “mess” contained and with activities for them within reach. Keeping to children entertained on a road trip this long was an experience that Cory and I both were dreading. We knew we needed to keep activities on hand that they would love while still allowing us to put in 8 hour driving days in the car. The 5 travel tips above were life savers for us and kept our time in the car as pleasant as possible for our family vacation filled with positive memories. What travel tips do you have for keeping the sanity in the car? What is the longest car ride you have made with your children? How have trips changed since you were younger? These are really good ideas! 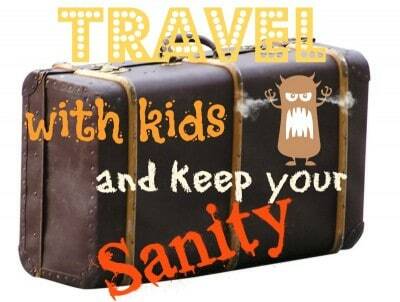 I traveled a lot when I was younger and my daughter was a few years old-this would have been really helpful!